Sorry for the delay, I’ve been really busy this past week since I just started working again. 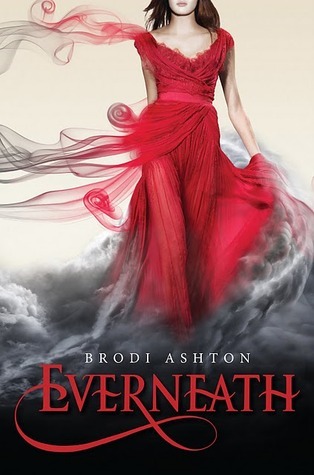 Anyhoo, I was able to finish Everneath by Brodi Ashton last night since I was on nocturnal duty and I honestly had nothing better to do. So, the main characters of the story are Nikki Becket, Jack and Cole. The cover is gorgeous isn’t it? I got sucked in by the Tunnel because of this cover. haha. You didn’t get the joke there? Too bad. I guess you just have to read the novel. Anyway, the story is somehow similar to the tale of Orpheus and Eurydice and if you have been reading my blogs then by now you should know that I am a fan of Greek myths and such. I loved the book. I seriously could not put my iphone down. I might actually buy a hard copy. I seriously wanted to read more about the underworld. This book just left me craving for more. The heroine of the story is called Nikki “Becks” Beckett. She has been stuck in the Everneath for 100 years (though it has only been 6 months in the Surface) and there her emotions are being sucked by Cole who is an Everliving. They somehow connected with each other after all those years. She has forgotten about everything except for a nameless face. I liked Nikki. I sympathized with her. I mean, I get it, it’s her fault that she got herself stuck in that situation but truth be told who wouldn’t be swayed by Cole’s offer? I would love to be pain -free. And somehow, her situation called for it. She made a decision without actually thinking about it and she probably got what she deserved but somehow she made me feel sorry for her. I love the way her character was written even if there were times when she just couldn’t make up her own mind. But she’s a girl so she’s excused from being fickle! haha. She’s not annoying and I love that somehow she knows how to stand up for herself. Then there’s Cole. I honestly liked Cole even if he was suppose to be the “semi -villain” in the story. haha. Is there such a word? Semi -villain? Anyway, I truly believe that he has strong feelings for Nikki. He’s probably just confused since he is not exactly familiar with things like love and relationships. He cares. Period. I love his quick changing temperaments. He can be nice one minute then ruthless the next. Plus he’s a rockstar! I’m a sucker for hot rockstars. I seriously wouldn’t mind being stuck with Cole for a long long time. Lastly, there’s Jack. Jack is the nameless face in Nikki’s memories while she was in the underworld. I seriously loved Jack. I love the fact that he never gave up on Nikki when she disappeared without a trace and even when she started to lose hope herself. That’s true love for me. The sacrifice that he made just made me teary -eyed. I could not get over that part. I seriously love Jack. And yes, I also love Cole. This is probably one of those situations when I simply can’t pick a guy. I love them both equally although Cole probably has ulterior motives but there truly is something about them that draws me towards them both. For a debut author, I think Brodi Ashton did a great job. I loved the concept of Everneath. I loved the way Greek, Egyptian or whatever myths incorporated in the story since I’m a sucker for myths and stuff. I think she made the entire concept of the underworld seem new. It’s quite refreshing to look at the underworld in a different way. I did find the ending a little sad. And truth be told I can’t wait for the second book to come out. I love the entire novel. I didn’t feel bored as I flipped through the pages. I’m giving this a 5/5 star rating.